We believe the Scriptures of the Old and New Testaments to be verbally inspired by God and inerrant by God in the original writings, and that they are the supreme and final authority in faith and conduct. We believe in the deity of our Lord Jesus Christ; in His virgin birth; in His sinless life; in His miracles; in His atonement for our sins by His blood, shed when He died for us; in His bodily resurrection; in His ascension to the right hand of the Father; in His personal, bodily, visible, imminent return to earth to establish His kingdom in power and glory. We believe in the literal account of creation, and that the Scriptures clearly teach that Man was created by a special, immediate, formative act of God; that Adam and Eve sinned, and thereby brought on themselves not only physical death, but also spiritual death-separation from God; and that all human beings are born with this sinful nature. We believe that the Lord Jesus Christ died for our sins according to the Scriptures as a representative and substitution sacrifice; that He rose again for our justification; and that all who believe in Him are justified on the ground of His shed blood, and are saved by grace through faith, wholly apart from human merit and works. We believe in the bodily resurrection of the dead; the saved to a life of eternal glory in Heaven, and the unsaved to eternal damnation. We believe in the present ministry of the Holy Spirit, by whose indwelling and in-filling the Christian is enabled to live a godly life. We believe that the primary goal of every Christian is to glorify the name of Jesus Christ in all that we do; therefore, we should separate ourselves from all practices and influences that hinder the Spirit-filled life. We believe it is the privilege and responsibility of every believer to do his or her utmost to give the Gospel of Christ to the whole world. We believe that the true, universal Church includes all believers in Christ during this present age, and is the body and bride of Christ, of which He is the head. We purpose to provide instruction in God’s Word and conventional instruction that meets or exceeds state standards for all who desire a Biblical foundation. To serve students who historically have been defined at risk and those underserved in traditional systems of education. "Educating Children in the Spirit of Excellence"
God is the Creator and Sustainer of all things, and the Source of all truth. God maintains control over His entire universe. True meanings and values can be ascertained only in the light of His person, purpose and work. Since all truth extends from God and the person of Jesus Christ, all Truth must be obtained from a Christ-centered position. We here at Emmanuel Christian Academy believe that Christian education is a guide to every aspect of life. “Train up a child in the way he should go, even when he is old he will not depart from it.” Proverbs 22:6 The primary purpose of Emmanuel Christian Academy is by the power of the Holy Spirit is to provide instruction in God’s Word and conventional instruction to meet or exceed state standards for all who desire a Biblical foundation. We believe that the most effective influences in a student’s life can be realized when the church, home and school work together. We believe that each has an immediate and direct influence on the developing student. 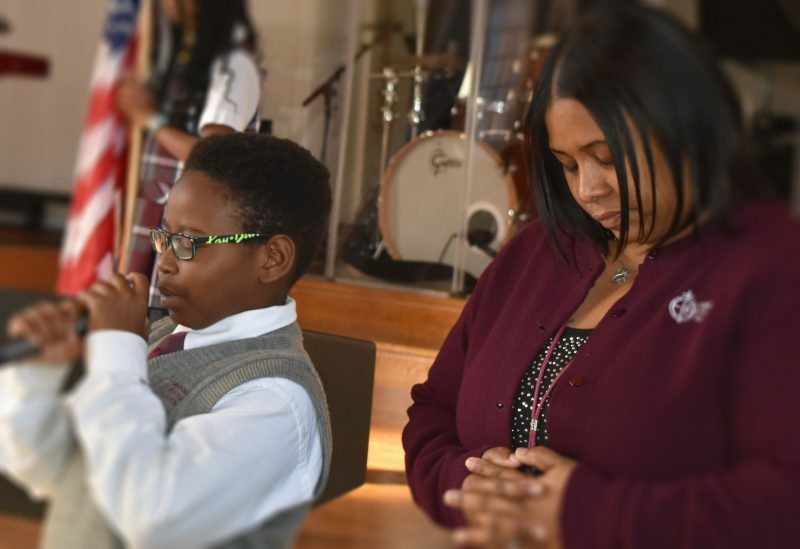 Emmanuel Christian Academy is an important ministry of the congregation in nurturing children in the Christian faith and reaching out to bring others to Christ. We also consider Emmanuel Christian Academy to be an extension of the home and also partners with the parents. We, fully trusting the power of God, have set ourselves to the task of teaching children that in life we must seek a proper relationship with God. This teaching is concerned not only with the counsels of God revealed in His Word, but also in the counsels revealed in His world. We desire to teach that ALL truth is God’s truth, and Jesus Christ is CENTRAL in all truth; again not simply in the Word, but in history in geography, in music, in arts, and in the universe (John. 14:6).